Boilers were used for both the mining and oil industries. 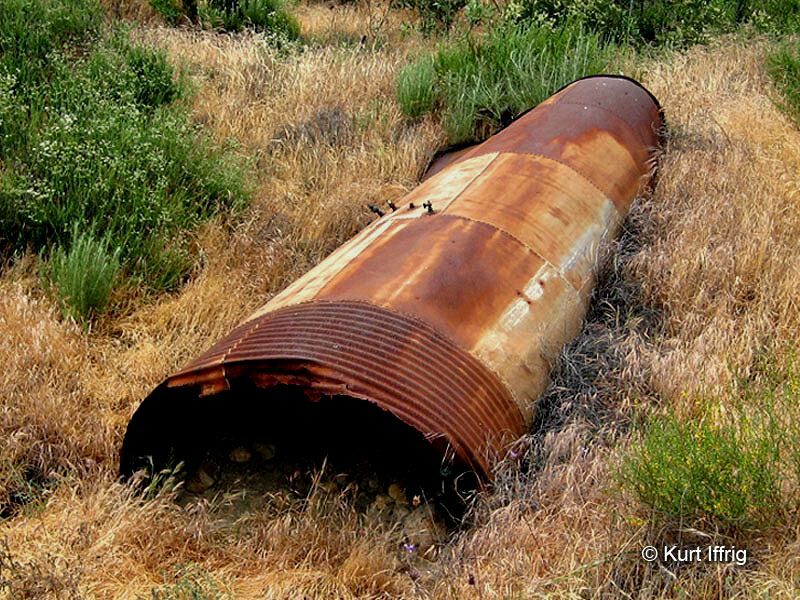 This one was found in the hills of Newhall. Primary Mineral: Oil, specifically 'asphaltum'. 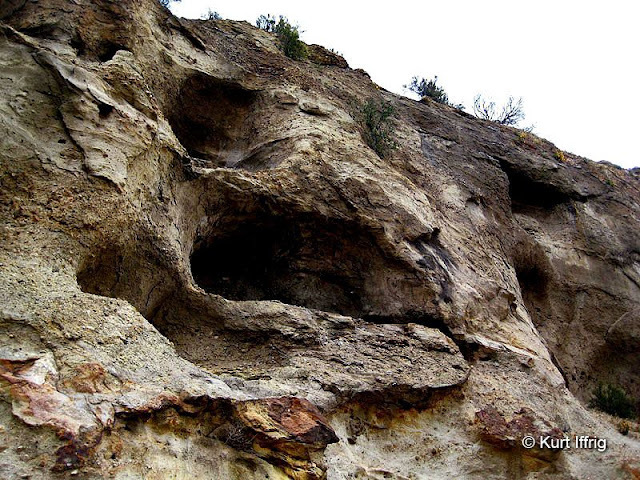 Although oil exploration is not directly related to mining, there are a few horizontal oil "mines" that can be found in Elsmere canyon, dug in the early days of exploration to trap oil seeps. Boilers in the oil industry had multiple uses, including heating up oil, making it easier to flow through pipes. One day while returning from a trip to Acton I noticed what looked like a large cave in the hills above the 14 freeway. Eventually I was able to turn around and get back to the approximate location. Unfortunately the cave “probably a shallow one” was on private property, and I was unable to climb up to it. Instead I decided to take a random hike on an unmarked road into the hills above Elsmere Canyon. What I found was a bit of a mystery. At first I thought I had happened upon on old mining site. Artifacts were strewn about, but they were not of the sort I had seen before. I noticed what appeared to be a head frame nearby, but upon closer inspection it was much too flimsy, and there was no shaft below it. Strange remnants of asphalt roads at impossible angles stretched up the hillsides. What was this place? And then I saw it, in the distance, just sitting there for at least 100 years in a brushy valley, an original miner’s boiler. I took a few photos, went home, and began researching abandoned mines in this area, but there were none. I later discovered that this was not a mining site, but one of the first oil fields in California, where dozens of oil wells once existed. 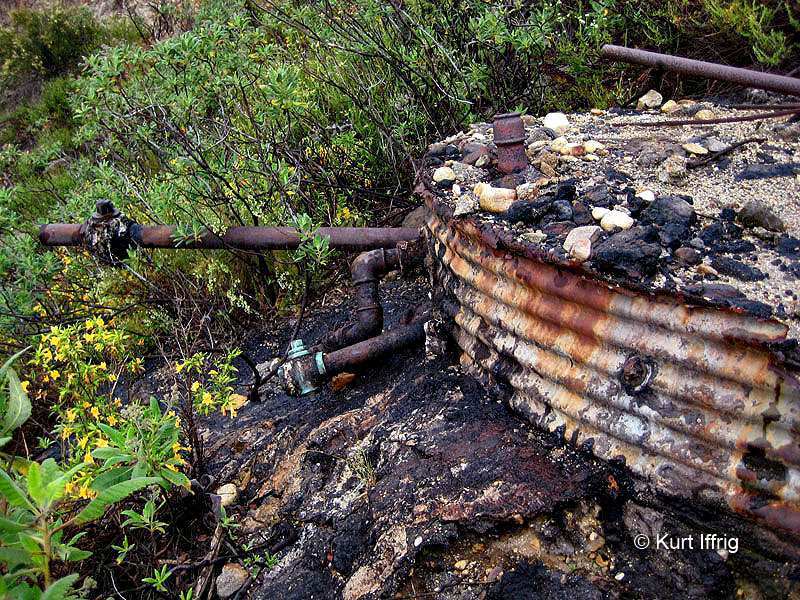 Why is this old oil site being included on an abandoned mine website? Simply to show you what a boiler looks like, and also because I enjoy history of all sorts, not just the California gold rush. This boiler, manufactured by the Union Hardware & Metal Co. probably dates back to the late 1800’s. I often call these miner's boilers, but that's not accurate. 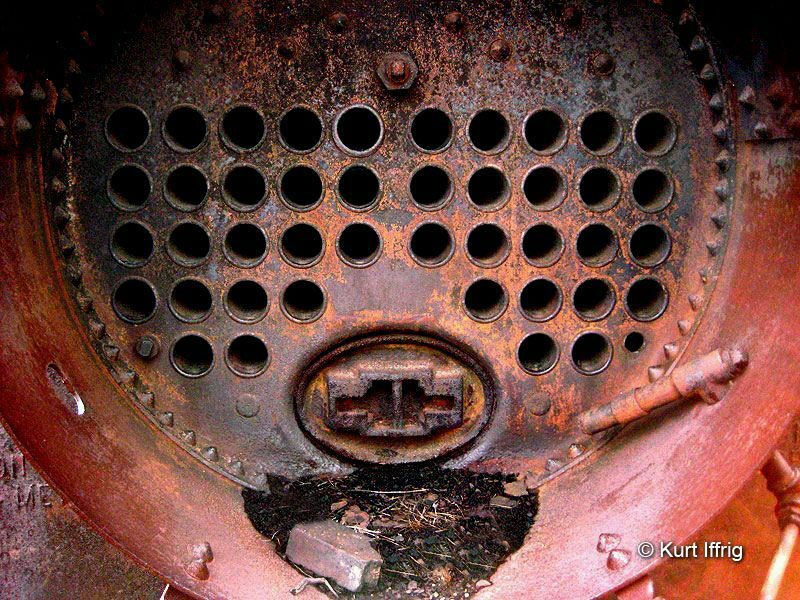 Boilers were used in many different industries for a multitude of purposes. They were basically steam engines used to generate power. In the mining industry they were often used to power tools, such as drills, jackhammers and even stamp mills. 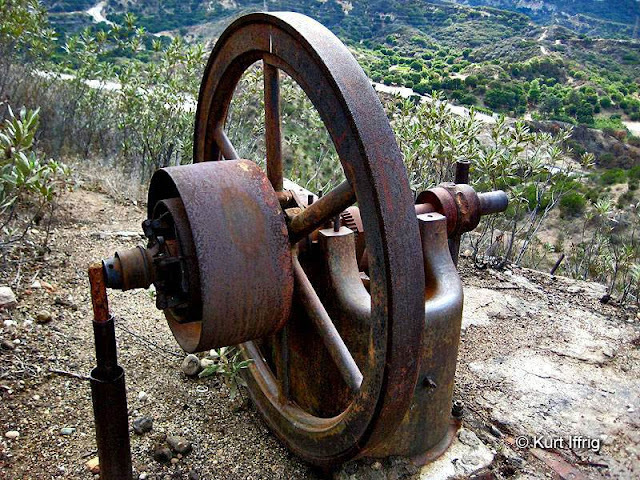 If you would like to see one of the last standing stamp mills in Los Angeles County click here. Some were portable and others were stationary. This particular one is a fire-tube boiler which probably had a number of applications, including providing the power for cable tool rigs and jack pumps. The boiler barrel would be partially filled with water, leaving enough space to accommodate the steam it would create. The heat source was inside a furnace constantly surrounded by water. Pipes ran through the inside, lengthening the path of the hot gases and increasing the pressure. The top of the unit had a chimney and a safety valve to release excess pressure. The chimney pictured in the first photo on this page would have had a smokestack attached. I found one lying nearby. You can see it in the additional photos at the bottom of this page. 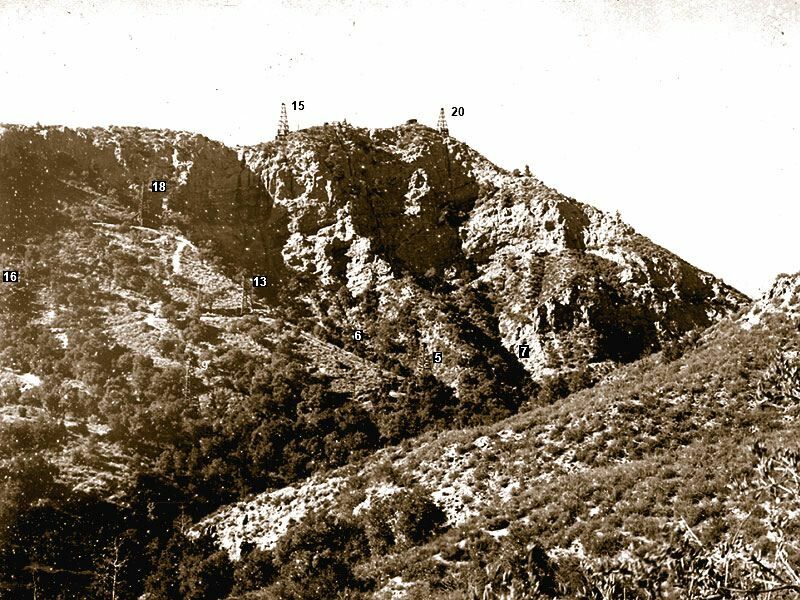 Photo of the slopes above Elsmere Canyon in 1907. If you look close there are eight numbered wells. Seven years before John Marshall’s famous gold strike at Sutter’s Mill, gold was discovered right here in Southern California. While lesser known, the original find, located in Placerita Canyon in 1842 began a sizable gold rush throughout the San Gabriel Mountains and far beyond. Unfortunately this gold strike has been largely omitted from history books, because at the time, California was yet to become a U.S. state. California would not seek statehood until 1849 and did not actually become a state until 1850. Who would have known that an even more valuable treasure would be discovered years later, in the same canyon? A view from the top of the ridge. There were originally two derricks on top and six more on the slopes below. 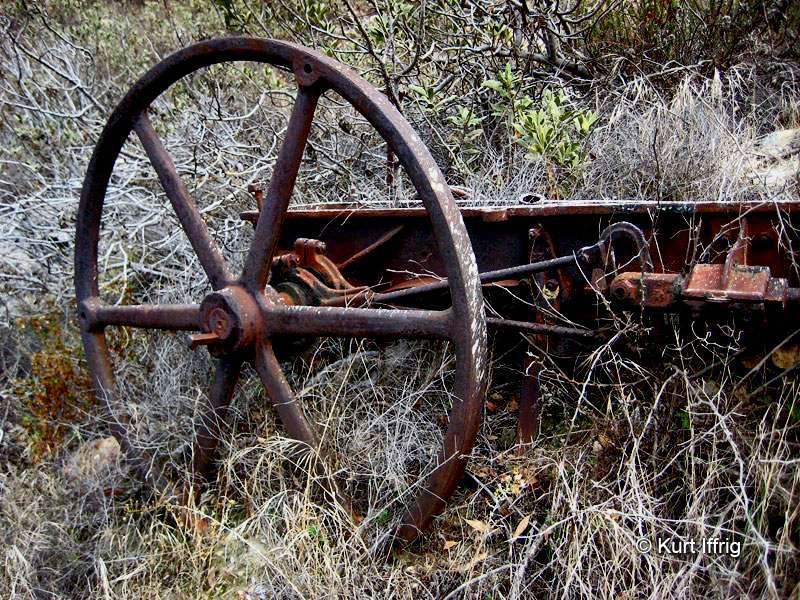 After the gold rush, a second valuable commodity was discovered in Placerita Canyon, WHITE GOLD! California's oil production began in the Newhall area around 1850, in the form of natural black asphalt or crude bitumen. But in 1899, a second, more refined oil known as white oil was discovered in Placerita Canyon, just a few miles from Elsmere Canyon. This see-through form of oil is rare and occurs only in small quantities. Unlike asphaltum, white oil is 83% gasoline. In fact it was so pure it used to be put directly into early Model T and Model A engines to make them run. It stank, and it smoked, but it worked perfectly, straight out of the ground. White oil was as clear as kerosene and able to burn 100 times longer than conventional oil. 100 - 200 barrels a day were pumped out of New Century Oil’s well No. 1. Surprisingly white oil is still bubbling up today on the grounds of the Placerita Canyon Nature Center. White oil gusher at Placerita Canyon’s New Century Oil Well Number 1. Photo taken in 1900. The oil extracted from Elsmere claims was natural asphalt or bitumen, similar to that of the La Brea tar pits. First and foremost, I would like to thank Stan Walker for his extensive research on Elmere Canyon. I do not pretend to be an expert in the history of California's oil industry, and without the help of his comprehensive website I would not have had a clue about what the artifacts found in and around Elsmere Canyon were. You can visit Stan’s website here … elsmerecanyon.com. According to Stan, many of the relics were identified by Jeff Brantly from Louisiana, so many thanks to him as well. A 1910 photo of the La Brea tar pits. Notice the numerous oil derricks in the background. The Elsmere oil field seen on this page is in the hills just south of Elsmere Canyon. It’s about 60 acres, and was part of the Newhall oil field. Elsmere was probably first inspected when oil claims were being filed in other canyons, around 1865. The Newhall oil field encompassed several canyons besides Elsmere including Pico Canyon, DeWitt Canyon, Towsley Canyon, Wiley Canyon, Rice Canyon, East Canyon, the Tunnel area (an area east and north of the old Newhall auto tunnel), and Whitney Canyon. Originally Placerita Canyon was also part of the field, but became its own field in 1949. This boiler above would have provided power for a single rig or a jack plant, powering multiple rigs. "A few days ago Mr. M. Kraszynski, who lives near Lyons Station, while passing up an arroyo in that locality, discovered thirty-two flowing oil springs within a short distance of each other." Captain Maurice Kraszynski had eight claims in the canyon, including the Clara, the Danbury and possibly one called the Elsmere. There are no records of attempts to drill in Elsmere Canyon in the 1860’s or 1870’s. Information on wells drilled before 1915 is difficult to find and sometimes non-existent. This is because prior to 1915 the Department of Petroleum and Gas did not exist, and owners reported to no one. Most of the wells in Elsmere were drilled before 1915. Through the years the Department of Petroleum and Gas became the Division of Oil and Gas (DOG) and was renamed again in 1992 as the Division of Oil, Gas and Geothermal Resources (DOGGR). You can view a list of wells drilled on this site at the bottom of this page. This flywheel was part of an old jack plant assembly. Sadly the wheel has since been stolen. 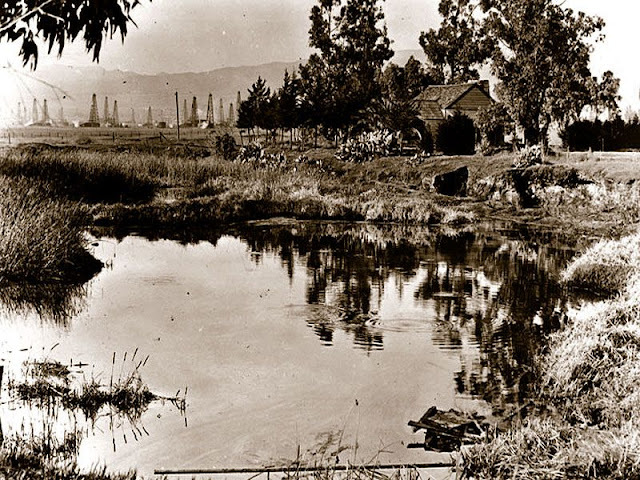 The first well drilled in Elsmere Canyon was by the Pacific Coast Oil Company. Elsmere 1 through 4 were drilled between 1889 and 1891. Elmere 5 through 20 were drilled between 1898 and 1900. In 1893 there was an economic depression called The Panic of 1893, which halted the drilling of additional wells until 1896. Then, in 1899, the Pacific Coast Oil Company received a patent from the federal government for most of Elsmere Canyon, giving them outright ownership. 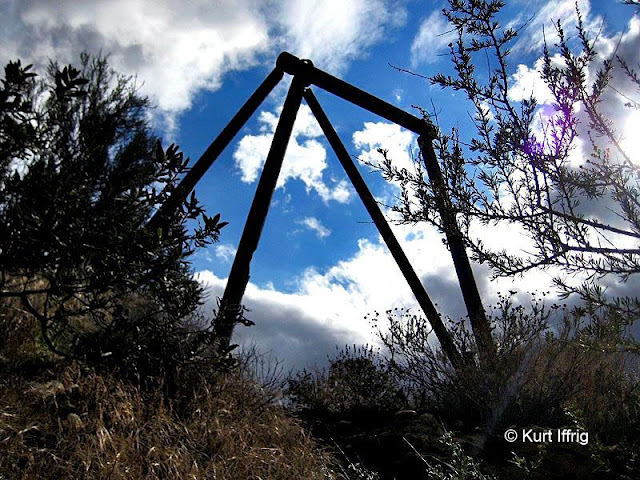 This is a ten foot high jack line cradle found on a hillside about 100 yards from the jack plant site. 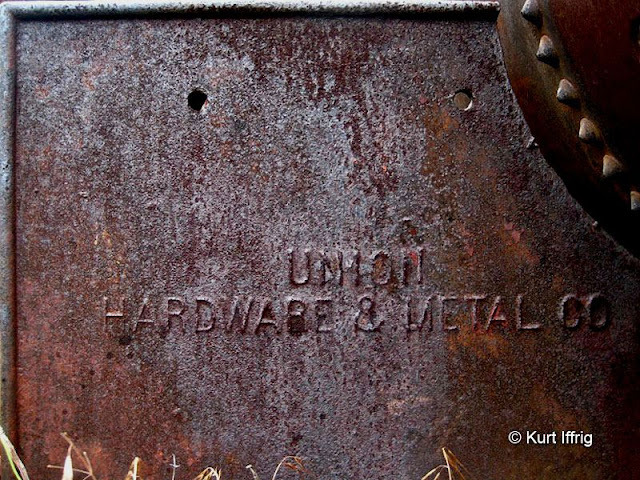 In the early days of the oil industry, each well was pumped individually. This wasted both labor and power. Each well required a man and a source of power, usually steam. Jack plants operated groups of wells simultaneously, with practically the same amount of labor and power, but it was not always possible to use this setup. The terrain, quantity of oil, type of oil, gas pressure, amount of sand, amount of water, depth of the well and other factors all played a role in which technology was utilized. Jack plants allowed wells that would have otherwise been abandoned to be profitably pumped for many additional years. Most of the wells in the Elsmere oil field were pumped by jack plants. This is a riveted sheet metal water separation or "shotgun" tank, used for separating oil from water. In the early 1890’s jack-line systems provided a huge stimulus to the industry by allowing operators to pump from multiple wells using only a single steam or gas engine. The cost savings were enormous compared to the expense of outfitting each well with its own engine. In 1884 jack-line systems were invented by George Allen, a former blacksmith and occasional oil field operator. First introduced in Pennsylvania oil fields, Allen’s invention consisted of a belt-driven wheel mounted on a vertical shaft with the hub offset, instead of running through the center of the wheel. This wheel, called an “eccentric” rotated within a second wheel, called a “slip wheel”. Shacked to the slip wheel were taut steel cables, called “jack lines” which stretched the slip wheel to oil wells balanced around the unit. Part of an old steam engine that was connected to a cable rig tool, probably used for drilling wells. 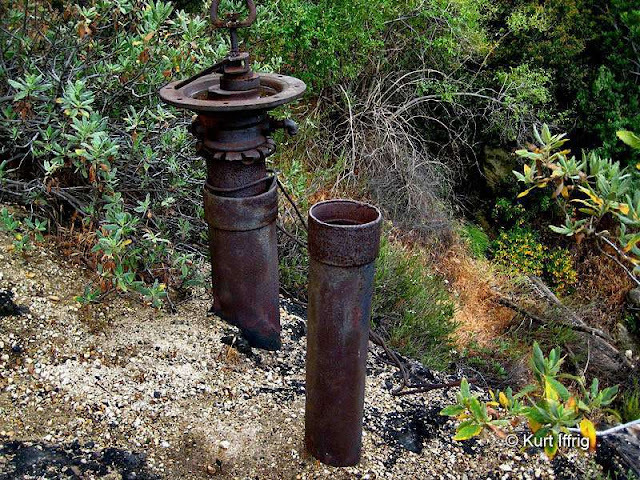 Most of the pieces of the jack plant assembly in the hills above Elmere Canyon are missing. In fact, since I took my latest photos, the flywheels has been stolen. The eccentric wheel has been rolled down a hill and now rests beside the boiler. Originally the jack plant was housed in a building. I know this from a 1921 photo of it, which appeared in in a book called “Oil-Field Practice” by Dorsey Hager, on page 118. These power plants were also called pump houses or jack houses. This item may or may not be the smoke stack that was at one time attached to the top of the boiler. If you’ve ever seen the opening of the Beverly Hillbillies TV show, you’ll remember Jed Clampitt hunting for rabbits and accidentally shooting a hole in the hillside, exposing a small gusher of black gold. Hollywood most likely came up with the Clampitt name from an actual oil family, E.A. and Margaret Clampitt, who owned several wells in Elsmere. The idea of oil bubbling out of the ground undoubtedly came from oil seeps, found all over this area. In fact, before oil wells existed, mines of a sort were dug into hillside to trap the seeps and acted as a reservoirs. Tataviam Indians who lived in this area used the seeps for coating and waterproofing their baskets, as well as for construction and medical purposes. Oil and water soaked sandstone caused many of the Elsmere wells to collapse or flood. Oil soaked rock was both a blessing and a curse. In 1875, just seven years after the completion of the Transcontinental Railroad, rail construction began in Soledad Canyon, linking L.A. to the north. Because of the sandstone composition of the mountain that was saturated with water and oil, frequent cave-ins occurred and the bore had to be constantly shored up by timbers during excavation. Eventually the longest tunnel, located near Lyons Station Stagecoach Stop, was abandoned and moved further west. Likewise, Beale's Cut, a narrow notch cut through the mountains near Newhall for wagons and stage coaches collapsed for the same reason. 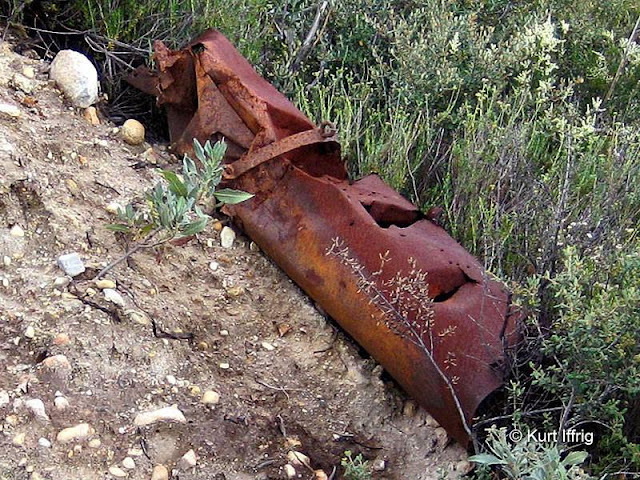 All that remains of the Clampitt 10 well, also known as Santa Ana 3, drilled in 1899, plugged in 1977. 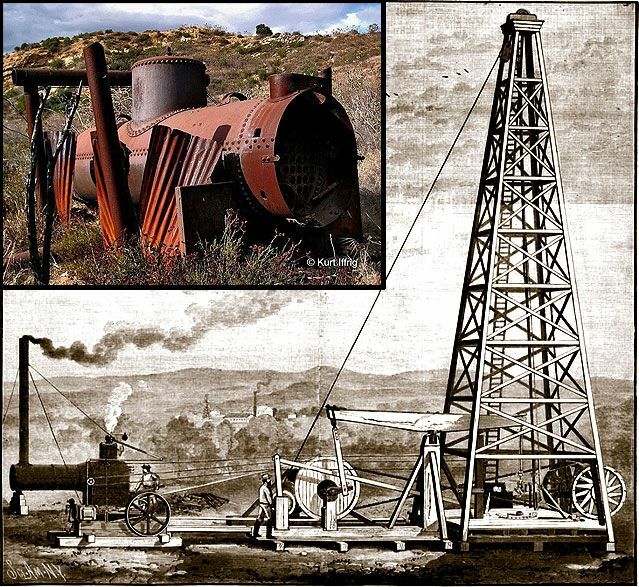 Not far from Elmere Canyon, Charles Alexander Mentry brought in California’s first commercially viable oil well, in September of 1876. 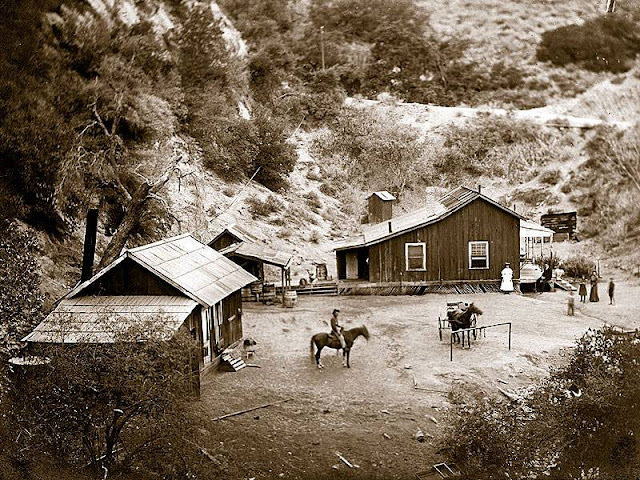 The location was Pico Canyon, near what is now called Stevenson Ranch. Oil was piped six miles east to California's first successful refinery in present-day Newhall and shipped out by rail. Eventually the Pico oil works were folded into John D. Rockefeller's Standard Oil Co. of California. Experienced drillers from Pennsylvania came to work the Pico oil field. Bachelors stayed in bunkhouses; family men erected cabins and even a schoolhouse and bakery in the town they called Mentryville. Mentry’s Number 4 oil well became the longest continually producing oil well in the world. Production slowed in the 1920’s, but the well did not entirely stop producing until 1990 when it was finally capped. Mentry would become Standard Oil’s Superintendent, and under his leadership 70 wells were drilled in several canyons, including 22 in Elmere. 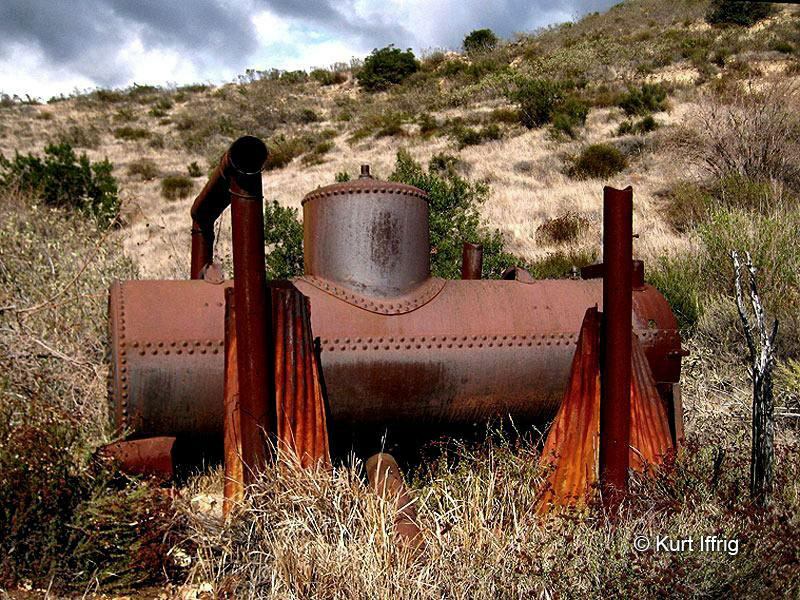 Today Mentryville is a ghost town, its few remaining structures standing as silent reminders of the birth of the California oil industry. Originally homesteads like the one pictured below were leased for home sites owned by the oil company. Those buildings have long since disappeared. Young homestead in Mentryville, 1905. Walton Young became Alex Mentry's successor after his death. Known as Cochems No. 1, this replica derrick was built in the 1960's and was never used to drill for oil. Parts and construction are authentic, except that this one was built at a smaller scale. It stands at 23 feet. It was built by Frenchy Lagasse, Alton Manzer and others in a place now known as Johnson Park, named after a retired Division Manager for the Southern District of Chevron. 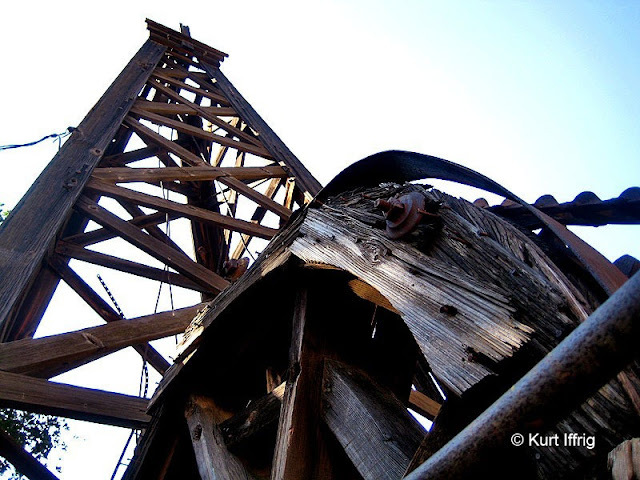 The derrick was called Cochems 1 after an oil worker named Bill Cochems, to mark his retirement. Johnson Park, once known as Pico Ghost Camp was used by the oil workers living in the canyon for recreation and picnics. It featured picnic tables, places to barbeque, a concrete dance floor, a bar, a horseshoe pit, and even a couple of craps tables. 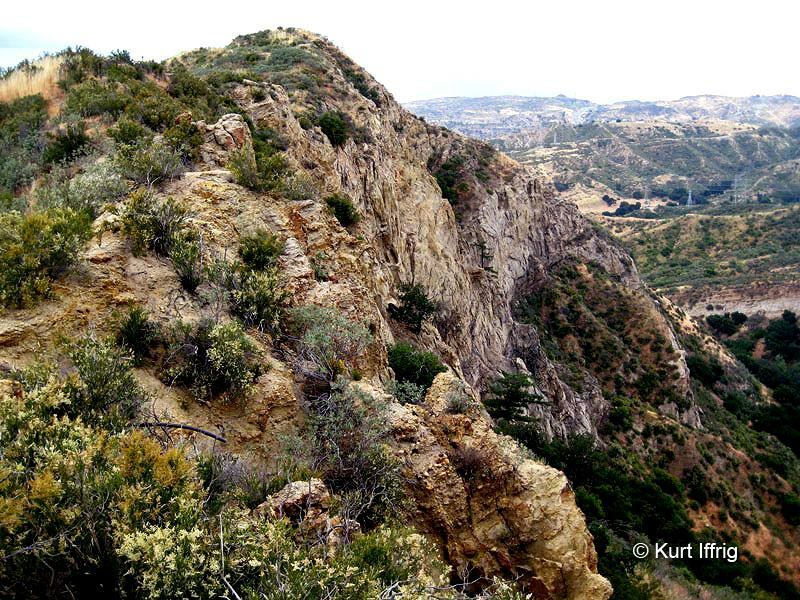 These grounds were also used by the American Association of Petroleum Geologists (AAPG) for an annual picnic in Pico Canyon when the park was known as the picnic grounds. Many of the original artifacts associated with the derrick are now missing, however the bulk of the structure still remains. You can see more photos of Mentryville and Johnson Park at the bottom of this page. This replica derrick was built to honor Bill Cochems, an oil worker who retired in the early 1960's. Pacific Coast Oil Co (Chevron) Elsmere 1 1889 1376 Showings of oil & gas. No production. Caving in and water problems. Abandoned 1890. Plugged in 1990. Pacific Coast Oil Co (Chevron) Elsmere 2 1890 600/1226 12 bpd Apr. 1891; 6 bpd 1894 Still producing in 1954. Plugged in 1977. Pacific Coast Oil Co (Chevron) Elsmere 3 1891 555 Small showing of oil with water Abandoned-could not shut off water. Plugged in 1991. Pacific Coast Oil Co (Chevron) Elsmere 4 1891 705 Small showing of oil and gas Abandoned. Plugged in 1991. Pacific Coast Oil Co (Chevron) Elsmere 5 1898 555 Init. prod. 23 bpd. Producing in 1954 Last prod. 2 bpd oil and 3 bpd water in 1929. Plugged in 1977. Pacific Coast Oil Co (Chevron) Elsmere 6 1898 395/1020 40 bpd Nov. 1898. 21 bpd 1913. 1-3 bpd in 1929 Deepened in 1913. Producing in 1954. Plugged in 1977. Pacific Coast Oil Co (Chevron) Elsmere 7 1898 435/1140 20 bpd in 1899. 8 bpd in 1913. 1.5 bpd in 1929. Deepened in 1913. Producing in 1954. Plugged in 1977. Pacific Coast Oil Co (Chevron) Elsmere 8 1899 500 Several showings oil and gas. No prod. Abandoned - unable to shut off water. Plugged 1991. Pacific Coast Oil Co (Chevron) Elsmere 9 1899 600 Init. prod. 23 bpd 1899. 1 bpd in 1929. Producing in 1954. Plugged in 1977. Pacific Coast Oil Co (Chevron) Elsmere 10 1899 930/997 No record of initial prod. 2 bpd in 1929. Producing in 1954. Plugged in 1977. Pacific Coast Oil Co (Chevron) Elsmere 11 1899 700 Several showings oil & gas. No prod. Abandoned - unable to shut off water. Plugged in 1991. Pacific Coast Oil Co (Chevron) Elsmere 12 1900 1225 Several showings oil & gas. No prod. Abandoned - unable to shut off water. Plugged in 1991. Pacific Coast Oil Co (Chevron) Elsmere 13 1899 645/1895 Produced. No record of initial prod. Abandoned in 1912. Plugged in 1991. Pacific Coast Oil Co (Chevron) Elsmere 14 1900 490 Produced very little Abandoned 1900. Plugged in 1991. Pacific Coast Oil Co (Chevron) Elsmere 15 1900 995 Produced. No record of initial prod. Abandoned 1913. Plugged 1991. Pacific Coast Oil Co (Chevron) Elsmere 16 1900 551 Produced. No record of initial prod. 3-4 bpd oil in 1929 Producing in 1954. Plugged in 1977. Pacific Coast Oil Co (Chevron) Elsmere 18 1900 675 Produced. No record of init. prod. 2 bpd in 1929 Producing in 1954. Plugged in 1977. Pacific Coast Oil Co (Chevron) Elsmere 19 1900 848 No record of init. prod. Abandoned 1901 - unable to shut off water. Plugged in 1991. Pacific Coast Oil Co (Chevron) Elsmere 20 1900-01 1013 Produced. No record of init. prod. 4 bpd in 1929 Producing in 1954. Plugged in 1977. Standard Oil Co. of Calif. (Chevron) Elsmere 21 1916-17 783/1611 Init. prod. 25 bpd oil and 13 bpd water. 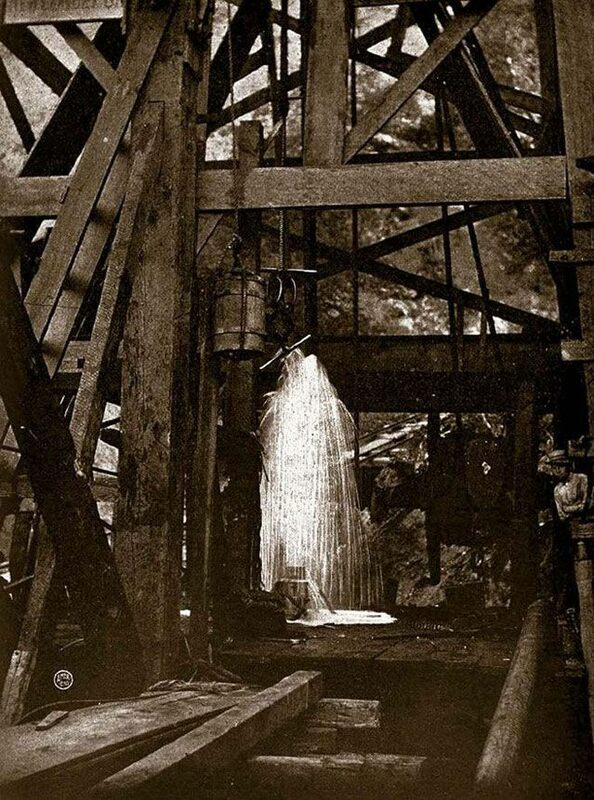 3 bpd oil 200 bpd water in 1925 While trying to abandon well in 1917, jarred casing at 783 ft producing 20-30 bpd, so well was kept active and deepened to 1611 ft. Abandoned 1927. Standard Oil Co. of Calif. (Chevron) Elsmere 22 1917 619 6 bpd oil and 45 bpd water Abandoned 1918 - would not produce commercial qty of oil. Plugged in 1991. Alpine Oil Co. (Sewell & Jones) Alpine 2 (Clampitt 6) 1901 850/950 Produced Bought by Clampitt in 1907 and deepened to 950ft. Plugged and abandoned by Chevron in 1980. Santa Ana Oil Co. (Sewell & Jones) Santa Ana 1 (Clampitt 8) 1901-02 1009 Producing in 1934 Abandoned before 1950. Plugged 12/29/2012. Santa Ana Oil Co. (Sewell & Jones) Santa Ana 2 (Clampitt 9) 1902 986 Producing in 1934 Abandoned before 1950. Never plugged. Santa Ana Oil Co. (Sewell & Jones) Santa Ana 3 (Clampitt 10) 1902-03 875 Producing in 1934 Abandoned before 1950. Never plugged. E.A & D.L. Clampitt (Sewell & Jones) Clampitt 11 1917 660 30 days after completion 15 bpd. Producing in 1934. Abandoned before 1950. Plugged 1/9/2012. E.A & D.L. Clampitt (Sewell & Jones) Clampitt 12 1918 1040 30 days after completion 20 bpd. Producing in 1934. Abandoned before 1950. Plugged 12/29/2011. E.A & D.L. Clampitt (Sewell & Jones) Clampitt 13 1920 690 Bottom filled with heavy oil - could not be pumped In 1938, filled with cement to up to 148 ft. Capped at surface for future use as water well, if needed. Republic Petroleum Co., Ltd Fink 3 1920 1250 25 bpd oil, 2.5 bpd water Rig blown over and well idle in 1934. Plugged in 1938 (with concrete cap at surface). Republic Petroleum Co., Ltd Fink 4 1921 1383 Little oil found. Work suspended after completion Rig blown over and well idle in 1934. In 1937, plugged from 119-97ft with cement (surface material already below 119ft), 97-5ft with surface material, and 5ft-surface with cement. Republic Petroleum Co. Amet 1 1921 215 0 Named after landowner Edward H. Amet. Abandoned after not finding oil sands. Plugged in 1968. Shallow Field Oil Co. 1 1921 1140 0 Abandoned. Plugged in 1938. Mike Barkett Barkett 1 1953 1982 Init. prod. 16bpd - after 30 days 8-10bpd. Stopped pumping in Oct. 1953. Plugged in 1957 after legal battle between Barkett and the landowners (which included the Clampitt Company) over Barkett not performing a water cutoff like he was supposed to. You're very welcome. That's a fascinating area that deserves more exploration.